1) Pray a morning offering. I like this one, but there are lots of ways to offer your day at the very start. 2) Attach prayer to daily activities. 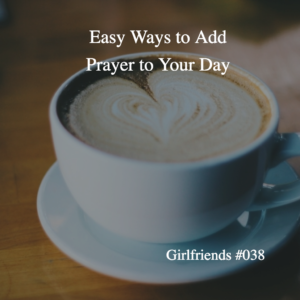 Whether you are driving or folding laundry, if you use daily actions as prompts to prayer, you will have regular reminders to connect with God. 3) Use music. Whether you like Christian rock or Gregorian chant, find and use music that inspires you throughout your daily activities. 4) Pray for your family one word at a time. This is a little practice I use to pray for many people I know and love in a focused way. 5) Use an examination of conscience. This is a great way to reflect on your day, ask forgiveness, ask for help, and give thanks at the end of each day. This week I share an inspirational conversation I had with farm wife, mom, and theological writer Gina Loehr. This energetic lady shares about life on the farm as well as some surprising ways in which God has called her to motherhood and a professional life. She even met Pope Francis and has a new book out about that experience, The Church is Our Mother: Seven Ways She Inspires Us to Love. Check it out! Thank you SO MUCH to Christen who left an iTunes review, and Sarah Reinhard who left a voice message abotu how much she loves Daria Sockey, and to Tracy who is our newest supporter on Patreon. Thank you so much for your encouragement and support of the Girlfriends podcast. I love hearing from you!